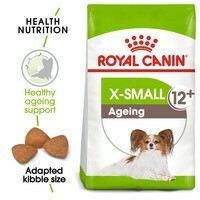 Royal Canin X-Small Ageing +12 Dog Food is a complete food for senior, very small breeds of dog over the age of 12 and weighing up to 4kg. Formulated with a patented complex of antioxidants and an adapted phosphorus content, the food also contains a selection of nutrients designed to help support good cardiac function in ageing dogs. Enriched with EPA-DHA, the food also contains essential nutrients that help support your dogs urinal system as well as ensuring they maintain a healthy skin and coat. It's exclusive formula also easily rehydrates to help ageing dogs eat with appetite. Suitable for dogs over the age of 12 and weighing up to 4kg. Polecam produkt. Wielkość pokarmu jest idealna dla mojego 18 letniego yorkshire terrier i bardzo mu smakuje. Szybka przesyłka do Polski. Thank you VetUK :) "I recommend the product. The size of the food is perfect for my 18 year old yorkshire terrier and it tastes great. Fast shipment to Poland. Thank you VetUK :)"